You know how frustrating it is when a well-meaning loved one says “I know how you feel” when he/she really doesn’t have a clue. To be honest, I’m annoyed even mentioning this scenario. But even though this statement has been tossed around flippantly and abused quite a bit, please don’t roll your eyes too far back in your head as I utter the same exact words, “I know how you feel.” We might not come from the same city, state, or even country, but there are a few core feelings you have as a stay-at-home mom (SAHM) that are somewhat universal. So, hear me out. I get it—that loneliness you feel because I’ve been there too. We both know you aren’t actually alone… neither of us are. We have precious little people to look after and love and cuddle with and train. But sometimes all you want is ten minutes of adult conversation—the kind of talk that doesn’t involve the color scheme of boogers and poop or which Paw Patrol pup is your favorite (Rubble… duh!). And I understand those feelings of envy that creep in uninvited. As your working mom friends chat about their individual deadlines, cranky bosses, social work events, and their diverse coworkers, you sit silently wondering when would be a good time to interject your projectile vomit escapade from that morning. You so badly wish you could relate to these amazing women and at times envy their “glamorous” lifestyles—oh, to feel the need to always have your hair and makeup done. Sigh. Can I let you in on a little secret? From what I hear, these friends of ours struggle too. They sometimes envy our “glamorous” lives (insert chuckle here) of staying in pajamas all day while barely ever having to leave the comfort of our homes. I guess the grass is always greener on the other side, isn’t it? I know that you feel alone in your struggle some days as you sweep up Cheerios for the 3rd… no 5th… make that 1,563,248th time and realize that your once happenin’ life has been reduced to mundane, mediocre task completion. Breakfast made. Check! After breakfast cleanup. Check! Interactive and educational play. Check! Reading time. Check! Laundry. Check! Lunch made. Check! After lunch cleanup. Check! I think you get the point. It all seems so trivial compared to managing a company, teaching a class full of students, or saving lives in a hospital. But friend, we ARE accomplishing these jobs… maybe not on as wide of a scale and for a lot less pay… alright NO pay. But we are managing our households and budgets. We are teaching our own children every day. We keep these kids alive. I can’t tell you how many “close calls” we’ve had and how many booboos I’ve mended. We should be proud and simultaneously humbled by this calling in our lives! We DO have purpose, and our job is just as important as any other paid, full-time job! Friend, I see you longing for true companionship outside of your children yet also craving alone time. Others might not understand why someone who feels so lonely would desire “alone time,” but I do— “me time” is a rarity. When you live the SAHM life, you dream of spa days… heck, I’ve said it before… you dream of peeing ALONE. The ever-changing emotions involved are difficult to navigate, and some days we don’t even understand how we are feeling. The truth is, we are one giant oxymoron! Loneliness comes with the territory… but we don’t have to drown ourselves in it. You are not isolated in these emotions. I feel them too and so do so many other moms! The best thing we can do is open our eyes to the extraordinary privilege it is to be a “full-time mom” and find other women who are traveling down this road too. You might feel lonely a lot of the time, but that doesn’t mean you are alone! Thank you, Eryka! So glad you liked it! Carving out a little me time to sit still, read a book, or listen to our favorite song so important even if it’s just for 10 minutes. Who am I kidding…5 minutes. My kids are 8&11 and I still can’t pee on peace. One day tho…. Hahaha will we ever pee alone again? ?…that is the question lol. But seriously, yes! We have to take a little time for ourselves! As a working mom I truly value this time around adults and the opportunity to get a little me time on lunch breaks without all the extra guilt. It’s hard to be away from the kids but it’s what’s best for our family. It’s admirable that you do what’s best for your family no matter what! I admire you, friend! Such a great read, as always. 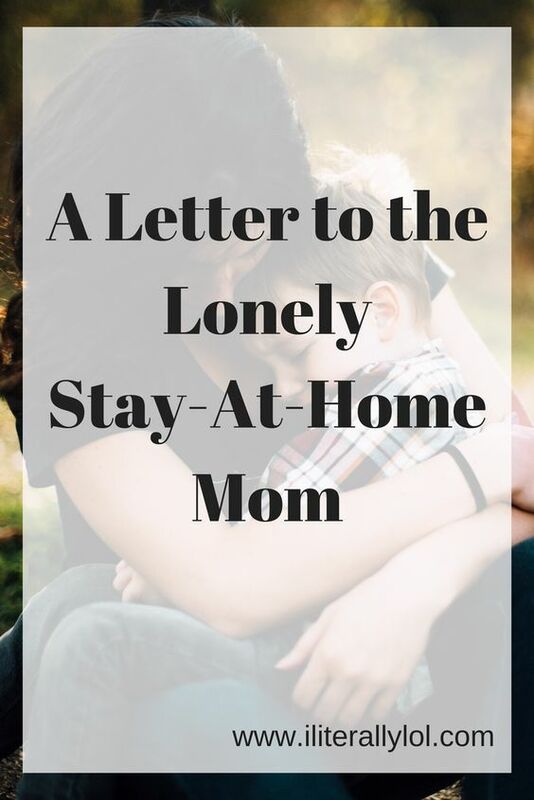 I am a stay at home mom and can attest that it does get lonely at times. Glad we are in this together! I definitely am there sometimes. I have those days where I’m just like, whyyyy haha! Thank you for this post! Oh girl, it’s hard sometimes…I know! Love this post!!!! It’s spot on! Thank for this, I loved it. I’ve been a stay at home mom for 5 years now and I’m at the point that I want to be out there working. That being thanks again. This was perfect and wonderful and beautifully written! I can not agree with you more that I feel like a giant oxymoron day in and day out. I loved this post and it resonated with me. It’s nice to remember that the grass isn’t always greener. At the end of the day I’m getting to raise my own kids and that is such an amazing job! Thank you this!! This makes my heart so happy! Thank you for sharing!